NYC Restaurant Week Returns For its 22nd year, offering New Yorkers a great meal at a very affordable price. 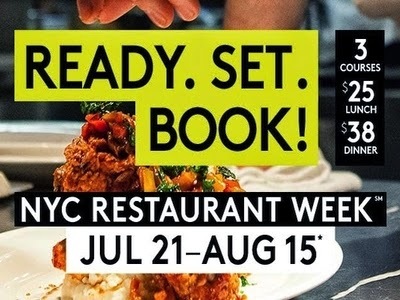 From Monday July 21 thru Friday August 15 enjoy a three course lunch or dinner at over 300 of NYC's top restaurants for a fraction of the cost. Lunches are $25 and dinners are $38! Start arranging lunches and dinners with friends now! Bookings are live and new reservation spots open up the whole time. NYC Restaurant Week is New York City's original dining celebration and a pioneer in the dining industry. As the country’s first-ever restaurant week, it debuted in 1992 when it was developed as a one-time culinary event to welcome the Democratic National Convention (DNC) to the City. Though created to appeal to delegates and other DNC attendees, the program—with 95 participating restaurants—also found a strong following among residents excited to dine at some of the City's top restaurants for a fraction of the usual cost—$19.92 for a three-course lunch—and who wanted NYC Restaurant Week to be a recurring event. Over the past years, NYC Restaurant Week has grown tremendously yet has remained committed to giving visitors and residents the opportunity to experience the quality, variety and hospitality that embody the NYC dining experience. Click link- Grab your NYC Restaurant Week Table NOW!